All waterproofing challenges are different, but they are all causes for concern. Our customers trust us to deliver craw lspace waterproofing services that stand up to the test of time and relieve their concerns about their home’s future. As one of the largest crawl space waterproofing companies in the United States, we’ve built our reputation on innovation. Whenever we encounter a challenge or limitation in the current technology available to crawl space waterproofing contractors, we start from scratch to develop better systems and practices. The results? 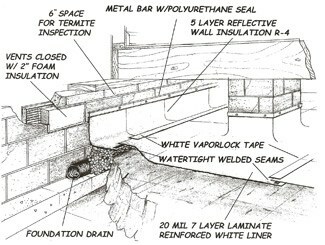 Our patented approaches to crawlspace waterproofing and basement waterproofing. Our patented Dry-Tec crawlspace system was custom designed to offer customers unparalleled crawlspace waterproofing services. Because crawl space waterproofing needs to be approached in a completely different manner than basement waterproofing, we combined the latest innovations in waterproofing–such as our state-of-the-art vapor barrier–with tried and true drainage methods. The result is that your crawlspace stays dry, drained, and problem-free. We all know that what happens under our home can greatly impact our daily lives. So if you’re worried about moisture buildup, or have suffered unexpected leaking under your house, we’re here to help you reclaim your crawlspace. Call us today to schedule a free estimate on your crawl space waterproofing project at (770) 458-0810, or fax us at (770) 458-0968.